We Be Reading: "The family of Dashwood had been long settled in Sussex." I have avoided reading Jane Austen's Emma because I find Emma's character in film versions to be quite repulsive through most of the story. I saved that novel for last, assuming it would be the Austen that I would enjoy the least. I never guessed that Sense and Sensibility would be so infuriating and would not have a single character that I did not find significantly deficient in some way. In the next couple of weeks, I will be reading Sense and Sensibility and Sea Monsters for the Chance Challenge (Challenge 8: Real and Inspired) and I can honestly admit that I will be rooting for the sea monsters. 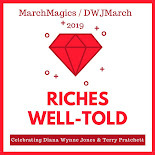 Elinor Dashwood and her younger sister Marianne experience a change in situation when their father dies and leaves his estate, Norwood, to their half-brother. They, along with their mother and younger sister, find themselves in reduced circumstances and they end up moving to a cottage on the estate of a distant relative. It appears to be sufficient for their needs and they settle in nicely. Elinor pines for Edward Ferrars, her sister-in law's brother, and Marianne meets the handsome and sporty Willoughby and both sisters seem headed on their way to marriage. It's quite a surprise then when Willoughby leaves town quickly and unexpectedly and Edward starts behaving with a strange reserve toward Elinor. What could be the source of trouble for these two seemingly well-matched couples? 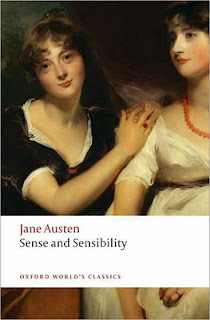 Support our site and buy Sense and Sensibility on Amazon or find it at your local library. We bought our own copy of it. I'm sorry you didn't like it. I haven't read this one yet, but I have read Emma. I really liked Emma because she was a character with so many flaws and I liked the fact that she undergoes a transformation in the end. I'm so sorry you didn't like this one. It's been years since I read it, but I did enjoy it--and I liked the characters. But I even like Mansfield Park, so I'm an easy sell with Austen. You know, I've never read Austen yet ... I'll be reading P&P instead of S&S and I'm very glad now. Go sea monsters!! Marianne Dashwood - the Austen character I love to hate. There is a great book trailer on you tube where M tangles with the sea monster. Like you I was rooting for the sea-monster. I like Elinor though - but I do wish she would do the sensible thing and hate Marianne too! All that self-effacing makes M so selfish. Grr. I love the book overall though, depsite the revolting Marianne. LOL S&S is by far my least favourite Austen, but I still enjoy rereading it on occasion (and I still love even my least fave Austen!). :) I'm rereading Persuasion right now; it's so marvelous. Emma has grown on me over the years...it used to be one of my least favourite, but it's been moving up the ranks. I love the idea that even if we make silly mistakes, we can grow and change and everything can turn out alright in the end. 1-P&P, 2-Persuasion, 3-Emma, 4-Mansfield Park, Northanger Abbey, etc. Last - S&S. I still like it, but the least out of all Austen books. I have never really loved any film adaptation of Emma, so I wouldn't base whether you will like the novel on them. LOVE the book, though!!! Passionate - I'm definitely going to try Emma next and, even though I had problems with this one, I will probably try a re-read in the future. Teresa - I liked Mansfield Park too! That's why I'm a bit surprised that this one bothered me so much. Jenners - P&P is a great place to start! Jux - Oh, Marianne is so terrible! I need to find that trailer. :) Elinor was just too reserved for my tastes. The fact that she couldn't even talk to her own sister was annoying. Eva - I think this will be my least favorite too because I have hopes for Emma. Like you said, it focuses on her change and improvement. I feel like nobody in S&S really changes all that much and yet things turn out well for them anyway. J - I think I would put Persuasion first and then P&P, Northanger, Mansfield and S&S last. I will have to see where Emma fits in there! And I'm glad to know that the book is better than the adaptations. It gives me even more hope.